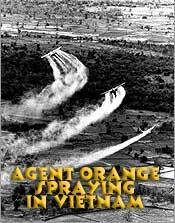 Agent Orange was one of the weed-killing chemicals used by the U.S. in Vietnam. The chemical compounds considered as herbicide agents in Vietnam include 2,4-D; 2,4,5-T and its contaminant TCDD (orDioxin) ; cacodylic acid and picloram. Airplanes, helicopters, trucks and backpack sprayers applied herbicides. 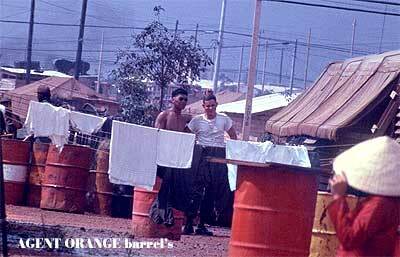 Herbicides containing Dioxin were used by the U.S. military to defoliate base camps and other facilities in the U.S. and in other countries as far back as the 1950s. The following diseases are those officially recognized by VA as related to herbicide exposure. To win benefits, VA law and regulations also require that some of these conditions appear (or ?manifest itself?) within a deadline that began to run the day you left Vietnam. If there is a deadline, it is listed in brackets after the name of the disease. If your condition is not listed below, ask your doctor whether what you have is similar to any of these. There may be room to argue that your condition is the same as one of these. - Chronic Lymphocytic Leukemia (CLL) NEW! - Under the VA rule, soft tissue sarcoma does not include osteosarcoma, chondrosarcoma, Kaposi?s sarcoma, or mesothelioma. On January 13, 1962, three U.S. Air Force C-123s left Tan Son Nhut airfield to begin Operation Hades (later called Operation Ranch Hand), the defoliation of portions of South Vietnam's heavily forested countryside in which Viet Cong guerrillas could easily hide. By September 1962, the spraying program had intensified, despite an early lack of success, as U.S. officials targeted the Ca Mau Peninsula, a scene of heavy communist activity. Ranch Hand aircraft sprayed more than 9,000 acres of mangrove forests there, defoliating approximately 95 percent of the targeted area. That mission was deemed a success and full approval was given for continuation of Operation Ranch Hand as the U.S. stepped up its involvement in Vietnam. Dates are insignificant because the Dioxin is still being found in heavy concentration's to this day in Vietnam (1999)! Educate yourself about issues facing Vietnam veterans and the nation; read some of the many good books that have been published recently. Join VVA/Vietnam Veterans of America to keep current on developments; if you are not a Vietnam era veteran, membership is open as an ?associate? member. MORE Agent Orange Info! at this Site. File a claim for VA disability compensation if you are disabled; encourage others to do so. NEVER GIVE UP! Volunteer your time and talents to the nearest Vet Center or veterans organization. Work with groups of veterans to set up a meeting with the Director of the nearest VA Regional Office to review how it handles claims from Vietnam veterans. Write your U.S. Representative (c/o House of Representatives, Washington, DC 20515) and U.S. Senator (c/o U.S. Senate, Washington, DC 20510) or visit their local offices to urge them to support increased compensation now for Vietnam veterans. Investigate what services are available from your state for veterans and how well those services are delivered. Encourage civic organizations, unions, and business associations to which you belong to take a stand on veterans? issues. There are no limits on when someone else (a so-called third party) can use his or her own money to hire and pay a lawyer to represent you. This third party cannot be a family member who may benefit from your claim. If you use a third party to hire a lawyer, the lawyer can represent you at the beginning of a claim. Also, there are no limits on hiring a lawyer when the VA is coming after you because of a home loan guarantee debt. Some private lawyers and some legal aid or legal services offices provide representation free of charge at all stages of a VA claim. VIETNAM VETERANS (& KOREA VETERANS who served in 1968-1969), and other veterans who may have been exposed to AGENT ORANGE or other herbicides elsewhere during testing, transporting or spraying of herbicides for military purposes and who are concerned about possible long-term health effects of AO exposure?contact the nearest VA medical center and request an AGENT ORANGE REGISTRY HEALTH EXAMINATION. There are more than 300,000 Vietnam Veterans that have already participated in this program. See your local phone book for more listings. MANY pages, on other sites, require for you to have Adobe Acrobat software. I am providing a link for a free copy & Info of such software. against enemy fire, BAR-B-Q pits and various tasks. WANT to see more photos of AGENT ORANGE?? Supreme Court's Decision on AO "June 2002"
PLEASE SEE THE ?SITE MAP? FOR MORE PAGES! Content on this web site is * Copyright * 1999-2007 ~ Cyber Sarge's (B W Milne) ~ All Rights Reserved.